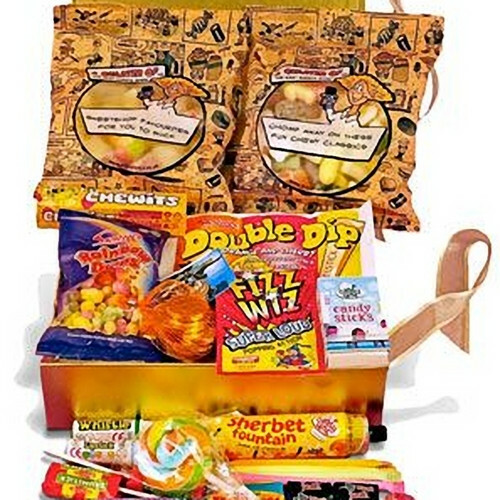 Gift Assortment - Ravishing Retro - A bumper selection of our most popular and delicious nostalgic sweets... so, if you want to give someone a little trip down memory lane, to the days when a sneaky trip to the sweetshop on the way home from school was the highlight of the day, this is the perfect gift!!! What an original gift! It comes in one of our wonderful golden gift boxes, tied with a ribbon... and it's absolutely crammed full of old retro favourites. One of our 250g bags of chewy classics to chomp away on - featuring fizzy cola bottles, fried eggs, foam bananas, milk bottles, Barratts shrimps, fizzy blue bottles, fizzy cherry cola bottles... and loads more. Chewits (remember the adverts with the Godilla-like creature?